Strapped into my seat on a return flight from Martinique to Barbados, I contemplated the meaning and consequence of this phrase as the stewardess rattled off the mandatory safety instructions in a neutral, matter-of-fact tone: “In the event of landing on water….” That can’t be a good thing. That would be a disaster, actually. It would mean we had fallen out of the sky and were sinking into the Caribbean Sea. But no one responded in any overt way to the stewardess’s cautionary words. No one checked under the seats to ensure the life jackets were really there. Travel is a precarious and disorienting experience. Weighted down by the belongings we drag along with us, we struggle to negotiate an unfamiliar and uncertain terrain. Christian Bertin’s luggage is particularly cumbersome, weighted down with words and history and memory. I recall an image in my mind of Christian making this same journey, but in reverse. Standing at the LIAT counter in the Barbados airport in preparation for our flight to Martinique, he is attempting to check in as baggage his Li Diab La, a large red barrel adorned with gold horns and mirror sequins which is strapped to an upright trolley. 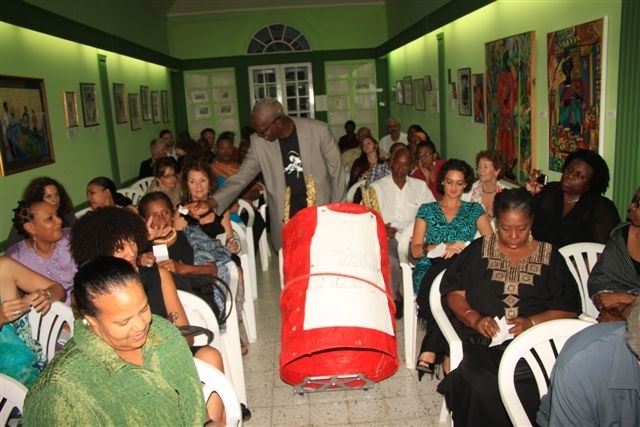 The barrel was used as part of his performance at the Barbados Museum during the Black Jacobins symposium in 2011. Bertin’s performance involved wheeling the barrel through the seated audience, disseminating pieces of paper with extracts from the writings of Aimé Césaire. Who better than Césaire to voice the trauma inherent in the leavings and returnings of travel. The author of the epic poem, Notebook of a Return to the Native Land, had first afforded the young Christian Bertin the opportunity to travel to France to pursue his artistic aspirations. Bertin approached Césaire, the long-serving mayor of Fort-de-France, seeking assistance to study ceramic art. Césaire told him that ceramics was taught nearby at SERMAC but Bertin explained it was too small; he needed something more expansive. Césaire saw his determination and gave him the necessary funds. And so he travelled to Macon in France where he would earn a diploma in Fine Arts. Christian’s approach to making work is eclectic and cross-disciplinary but very focused in intent. Working in painting, sculpture and performance, he incorporates found or recuperated materials. This includes not only metal barrels but also old pieces of furniture, machine parts, machetes, jackets, tin cups, dried mango seeds. The works are tactile and aggressive in their construction, often with worn surfaces of welded scars or a thick plastering of paint. These materials are worn, weathered, dented, decaying. They have a history. One of his interests has been the relationship between the local and the international, in particular the designation of certain places and peoples as peripheral and exotic, a remnant of the colonial history of the Caribbean. Bertin’s performance of Li Diab La was conceived as a response to marginalization of the Afro-Caribbean artist in the metropole. A short film of the performance by Sophie Arroüet shows the artist pushing the trolley through the streets of Paris, passing by familiar tourist attractions as if re-tracing Césaire’s footsteps in the late 1930s. He pauses beside the replica of the Statue of Liberty at the Pont de Grenelle, the large red drum visible with its four gold horn-like protrusions around the rim. The words “Li Diabl La” (“Here is the devil”) are visible on a small white flag. The devil is a popular figure in Caribbean carnivals / mardis gras. Césaire recounts seeing a similar folk character in Senegal as an example of Pan-African synergies throughout the diaspora. It also alludes to Césaire’s recollection of a visit to the Dalmatian coast when he encountered a peasant who on seeing the black man, feared that Césaire must be the devil himself. On the other side of the flag are the words “Supreme Masque”, the title of one of Césaire’s poems from the collection, Like a Misunderstood Salvation. Arroüet’s film captures Bertin walking by the demolition of a large concrete building covered with graffiti. He maneuvers his way through the crowds of busy Parisian streets; a couple lugging their own suitcases glance back at this curious fellow-traveller. He passes familiar landmarks such as Notre Dame Cathedral and the Pompidou. He pauses outside the iconic bookstore, Presence Africaine, paying homage to Cesaire’s pioneering work as a founder of the Négritude movement. Alioune Diope, the Senegalese philosopher, launched the magazine of the same name in 1947, featuring the writings of Césaire along with those of Léopold Sédar Senghor, Richard Wright, Albert Camus, Andre Gide and Jean-Paul Sartre. A decade later Diop and Présence Africaine organised the 1st International Congress of Black Writers and Artists (1er Congrès international des écrivains et artistes noirs) in Paris, which included Aimé Césaire. 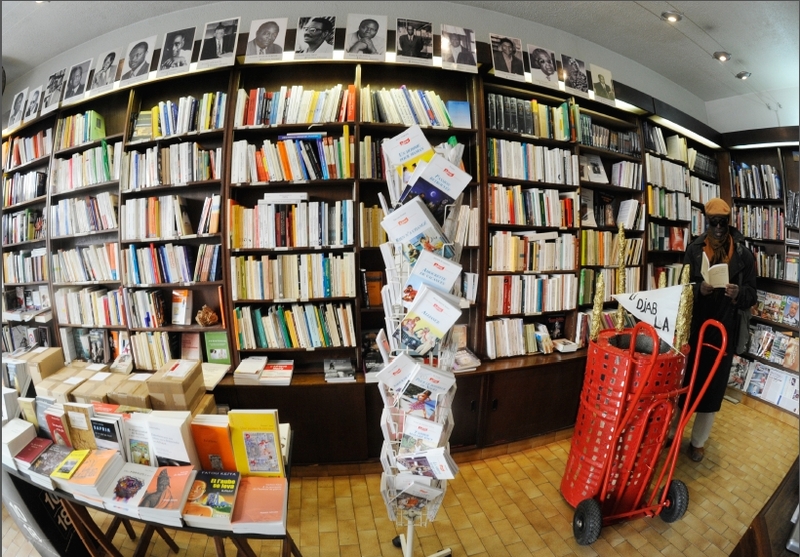 Today the richness of the literary contributions from Martinique are widely acknowledged. Following Césaire there is Frantz Fanon, Edouard Glissant and Patrick Chamoisseau. But, as Christian Bertin points out, visual artists have not received the same recognition. In addition the artists of Martinique are not viewed as French, but rather as subaltern. Bertin eventually makes his way to the Université de Paris where he reflects on the irony of the words engraved into the wall – “Liberté, Egalité, Fraternité”. He walks the streets of the French capital as an outsider. As an artist immersed in the traditions and concerns of the world, he is confined to the margins as exotic and peripheral. A subsequent performance of Li Diab La presented in Martinique was filmed by Laurence Henry. The location is Prêcheur, a small commune located north of Saint Pierre, in the shadow of Mont Pelée. Scenes of Bertin pushing the red barrel across a rough and isolated terrain are spliced with images of a night-time procession of participants carrying flambeaus in the annual celebration of Emancipation. The atmosphere is a stark contrast to the streets of Paris but in both, the artist navigates the environment as a solitary figure – a loner, a seer, a prophet. Mont Pelée holds particular significance for Bertin. A central theme in his work is that of violence: the violence of nature as embodied in the volcanic eruption of May 8th, 1902 that killed more than 30,000 inhabitants; and the violence of man as perpetrated through the transatlantic slave trade. The catastrophic destruction of both the natural and human atrocities remain in the present as scars on the landscape and psyche of Martinique. For Bertin, he has no choice but to address this history of trauma; it is, he explains, an inner imperative. When asked if he sees his work within the context of a Martinican or even a Caribbean aesthetic, Bertin responds that he sees himself as a global citizen. 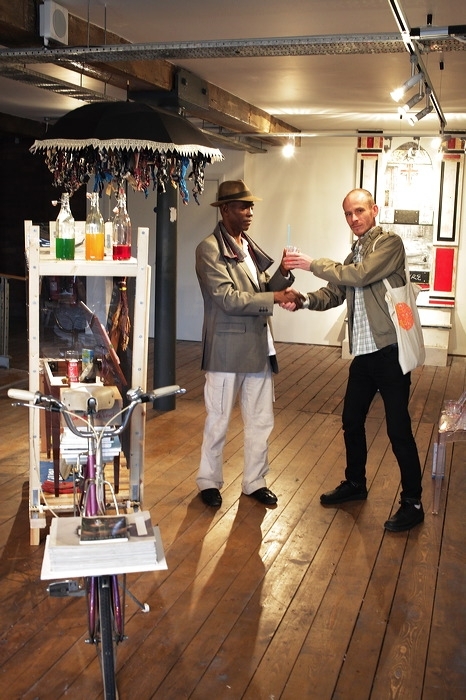 In fact, the first time I encountered Christian Bertin was at the 2010 Liverpool Biennial. Bertin was exhibiting as part of the collateral event known as City States which presented six international pavilions as a platform for examining relationships between urban centres across the world. One of these pavilions, The Caribbean Pavilion focused on work by ten artists from Martinique, Barbados and the Bahamas. A number of the artists including Bertin were invited to take up residence in Liverpool a few weeks before the exhibition opened to produce the work. The possibility of producing in situ removed the burden of transporting the art from the Caribbean to the UK. It also gave the artists time to reflect on the urban environment of Liverpool and respond to it. There is a long shared history between Liverpool and the West Indies. During the late 18th century, it is estimated that three-quarters of all European slaving ships left from Liverpool, transporting as much as half of the three million Africans estimated to have been carried across the Atlantic by British slavers. Liverpool’s merchants dominated the transatlantic routes during this time, deriving significant civic and personal wealth as a result. For the Caribbean Pavilion Bertin constructed another wheeled vehicle. Sinobal a Vendre (Snow Cones for Sale) takes the form of a vendor’s bicycle that offers customers cups of shaved ice topped with coloured syrup. But this eclectic cart also doubles as a library with desk, chair and stacks of books including Césaire’s Discourse on Colonialism. Whimsically decorated with a parasol, the bicycle is simultaneously rendered immobile by the weight of its cargo. And the syrups are the Pan African colours of red, yellow and green. Is the syrupy sweetness of the snow cone juxtaposed with the sobriety of the anti-colonial texts? Is the temporality of the ice shavings contrasted with the enduring weight of the written words? A posted sign warns viewers “Il n y en aura pas pour tout le monde.”…..there will not be some [or enough] for everyone. After these peripatetic encounters with the artist, the opportunity earlier this year to visit Bertin’s studio in Belle-Fontaine was long-overdue and an entirely different experience. Here was the artist at home, with raw materials and finished pieces that seemed anchored to the site, often indistinguishable from the construction of the studio itself. Christian Bertin was born in 1952 in Fort-de-France and grew up in Trénelle-Citron, an impoverished neighborhood on the edge of the city. In a documentary about the history of Trénelle-Citron made by Laurent Cadoux, the quarter is described as a favela. Bertin, who features in the documentary, outlines the resourcefulness required of the inhabitants to construct their houses from found and re-purposed materials. It is here that he acquired an‘inner sensibility’ in terms of his use of media, recouping functionality and value in objects which others had discarded. The real value Bertin is able to mine from these materials however is their histories that are stored within them like DNA or radio-activity. No matter where they are relocated and how they are retrofitted, they retain the traces of their past. Materials contain stories of technological processes, origins of raw materials, forces of market exchange, waste disposal and environmental repercussions. They embody tensions between the local and the global, between tradition and the contemporary, the personal and the collective. Bertin salvages and stockpiles all of this. And then he refashions it and takes it back out into the world, sometimes as a monumental projection from the landscape, but also as a humble and nomadic chariot, a fabricated pilgrim, a wheeled preacher, a masked prophet. For the nomad, for the diasporic journeyman, for the global citizen the weight of the objects we carry with us is equal to the burden of our stories we are compelled to bear. This is the message Christian Bertin seeks to deliver. When we find ourselves unexpectedly adrift in the ocean, I’ll be looking to hold on to the floating barrel. SERMAC is the Municipal Service for Cultural Action (Service Municipal d’Action Cuturelle), established in Fort-de-France in 1975.